The Scout Sniper Basic Course moved from its previous location at 3rd Marine Regiment to MCB Hawaii, Kaneohe Bay's Regimental Schools, in order to more efficiently train devil dogs of the 3rd Marine Division. The school will now receive its funding from the base and is also allowing other branches of the Armed Forces to attend the 10-week-long course. 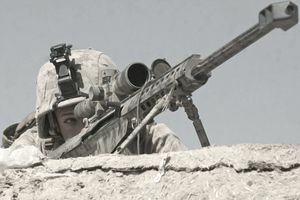 "The Marine Corps has the best sniper program in the world," said Gunnery Sgt. Richard Tisdale, staff noncommissioned officer in charge of the Scout Sniper School. "A sniper needs to be trained as best as possible because they must be combat ready at all times," he explained. "Due to the nature of the sniper's mission, they must be trained mentally and physically to operate independently forward of friendly positions on the battlefield." The Scout Sniper School has integrated Marines from the entire 3rd Marine Division as well as soldiers from the Army's 25th Infantry Division aboard Schofield Barracks, and Navy Seals from Navy Seal Delivery Team 1 located at Ford Island. Previously, the school only trained Marines with the regiment. "We are learning how to properly employ snipers, how to use the weapons, use camouflage and stalking techniques," said Army Spc. Joshua Garrison, a sniper with Headquarters Co., 1st Bn., 27th Infantry Regiment, 25th Infantry Division. "Soldiers can learn as much as they want from their unit, but to become sniper qualified, they have to attend this school. "This school goes further in depth than what units teach about basic marksmanship, weapons, camouflage, and reconnaissance techniques," said Garrison. The course is broken down into three phases. The first involves land navigation and marksmanship. During this phase, trainees fire sniper ammunition on long distance and unknown distance qualification courses. The second phase covers stalking techniques, field skills and call for fire rehearsals. The last encompasses everything from communication to surveillance performance. "When many people think of a sniper, they think of a person who randomly shoots people," said Tisdale. "A sniper selects his target and fires upon it. Marksmanship makes up only 10 percent of being a sniper. "We train our snipers to be patient and wait for the perfect opportunity to fire upon the target when it will best support the mission," Tisdale continued. "They could lay in a dormant position for days at a time before actually pulling the trigger and engaging on the target." Soldiers and other service members are paired up with Marines, so they can cross train one another, and at the same time, keep the Marines on their toes with the competition of training with another branch of the Armed Forces. The Marine sniper course is taught twice a year, and the range can be used for sustained training by any requesting sniper units throughout the rest of the year. "I think it is a great experience," said Garrison. "You get to see how the other services operate, and they get to see how you operate as well."